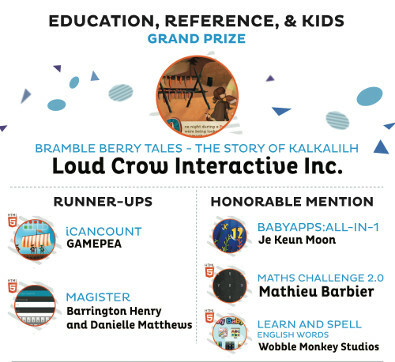 Bramble Berry Tales - The Story of Kalkalilh - Loud Crow Interactive Inc.
With Bramble Berry Tales we saw a need to bring three oral histories incredibly dear to the Squamish, Sto:lo, and Cree Nations to life. Dating back thousands of years the lessons these histories teach are as relevant today as they were the first time they were recounted. In The Story of Kalkalilh, a mischievous Lily sneaks out of bed, her mooshum (grandfather) shares a magical story filled with foreboding, dark surprises, and a warning about accepting treats from strangers. Ten frames can be used to build number sense, help students gain mental math fluency, and to better understand how to use the math strategies of composing and decomposing numbers, to complete operations over places. First graders are active not only in learning number facts to ten and twenty, but also building number sense by using manipulatives, pictures and other supports to better understand numbers. Math educators have increasingly found the importance of subitizing for math fluency. Use iCanCount 10frame interactive learning apps today, to help your kids/students to learn maths. Magister is a mobile app designed to make lesson planning more convenient for educators - teachers, lecturers, trainers, workshop conductors, among others. The app is also a class scheduler which saves the dates and class times for lessons, as you plan, in the built-in calendar. With no need for access to internet connection, you can use the app anywhere! Designed by a teacher, for teachers. BabyApps:ALL-IN-1 contains: BabyApps:Flash Card - 64 Flash Cards with great sounds, 16 Animals, 16 Foods, 16 Natures and 16 Life Things, Puzzle card including character's image; BabyApps:Finger Word - use finger dragging, drag LETTERS to complete a WORD; BabyApps:Letter Board - 26 Alphabet letters with speaking letter-names, easy and simple note; BabyApps:Dial-a-phone - 10 number buttons with great number-names sound, cool calling sound; BabyApps:Color Piano - 8 Color with great color-name sounds, Piano mode with piano sound, the piano be able to play easy songs. Learn And Spell English Words is an exciting and engaging bubble popping spelling game for young native learners and secondary language learners of all ages. Pop pictures and pop letters before the baddies get to them first! With Learn And Spell English Words you will learn English vocabulary, spelling and listening skills while having fun. Your daily mental workout! Improve your mathematics skills by solving simple arithmetic problems. Train yourself with 3 levels of difficulty and once you are ready, challenge the world with an online competition.